For the first time ever, Kiss have released an album that is a proper band effort. Way back in 1998 many onlookers presumed that the reformed Kiss had shot its last bolt in the shape of the unloved ‘Psycho Circus’. However after yet another reinvention, the turnaround in the Kiss camp has been a shocking joy to behold. Yes Peter Criss and Ace Frehley are now there in persona only, however with Eric Singer, who has an unbelievable 15 years service with the band - more than Criss - and onetime Black n’ Blue fret burner Tommy Thayer firmly accepted as the Cat and Spaceman, 2009s ‘Sonic Boom’ went down as one of the most spectacularly surprising albums for many a year. What was even more impressive was that in a move Kiss had long avoided, all of the songs had been penned by either lynchpins Paul Stanley and Gene Simmons, or indeed Thayer, with nary an outside writing influence in sight. That ethos was commendable, but it has been taken a step further with ‘Monster’ (and its awful cover) as possibly for the first time ever, Kiss have released an album that is a proper band effort. Thayer is involved with the writing of eight of the songs, with Singer also co-credited on the four-way writing split of ‘Back To Stone’. More amazingly, the guitarist and drummer also take centre stage on occasion, with Thayer fronting the band on ‘Outta This World’, which he put together with a lyric inspired by the “Spaceman” character he has inherited single-handedly, while Singer shows off his vocal skills on the Stanley penned ‘All For The Love Of Rock n Roll’, a song the Starchild wrote about the life of his drummer. Both tracks are highlights on an album that seldom dips, but that’s not to say that Stanley, who produced the album alongside Greg Collins, or the demonising bassist Simmons are taking it easy, splitting the rest of the songs between them and joyously trading vocals on the pulsating ‘Take Me Down Below’ and to a lesser extent, ‘Freak’, which strongly nods at Hendrix and Zeppelin. If you’re looking to criticise, then not much of ‘Monster’ surprises, this is Kiss doing what they do best, rocking hard and carefree, with an innuendo or two, ‘Take Me Down Below’, and casually passing comment on modern society in a way few notice that they always have, ‘Back To Stone’. However, most importantly the energy and fire with which it is all delivered hits home every time. Yes Stanley’s vocals are a little grittier these days and he reaches for the stratosphere less than he once did, but that doesn’t stop ‘Hell Or Hallelujah’ or ‘Last Chance’ being classic Kiss, while the Simmons led ‘Eat Your Heart Out’ becomes a Frehley like rocket-ride of a song with a reassuringly flabby signature bass sound reverberating around your skull. 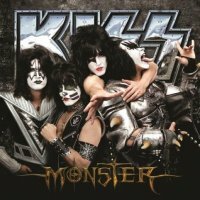 ‘Monster’ is indeed just that and with the knowledge that Kiss head toward their 40th anniversary in top gear, all once again feels well in the world of rock and roll!